The Pitch: "Hi, I'm Rob Lowe and I have DirecTV. And I'm Former Network TV Star Rob Lowe and I'd really rather not be on cable." 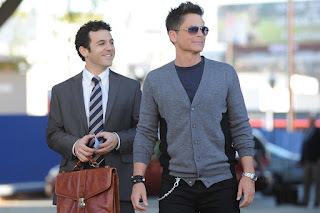 Quick Response: While occasionally funny and never truly unpleasant, "The Grinder" is a very, very pilot-y pilot. It spends its entire time trying to justify its premise -- Former star of a legal TV show returns home to put his TV skills to use at his family's legal practice -- and the result is far heavier-on-its-feet than it should be. There's a lot of effort put into announcing -- not always showing -- how overly cautious Stew (Fred Savage) might be improved by Dean's (Rob Lowe) "never settle" Grinder persona, but how Dean might be semi-ironically unsettled in his private life, while Stew has a wife (Mary Elizabeth Ellis) and kids and security. It all climaxes in a not-especially-creative and not-especially-funny and way-too-long courtroom scene in which everybody proves their value to everybody else and I stopped laughing entirely. "The Grinder" is, for want of a better word, a bit of a grind. And after 23 minutes, I was left only with a sense of the premise, but no sense of how long it could possibly sustainable, since once the plot was in motion, it was only limitedly funny. It's going to help when, in Episode 2, Savage's character is smoothed out so that he isn't simultaneously being talked about like he's a good lawyer, while also being shown in the courtroom with a pathological discomfort that renders him far more pitiable than he thematically should be. Savage isn't bad. He's just playing what he's been given by the writers and what he's been given by the writers needs to be depilotized. Lowe's character also has been written one-note and although he hits every punchline in the first half with the expert timing we've watched him hone over the years, there's a key ostensible emotional beat that either Lowe or the show can't decide is genuine or not and it falls flat. There are, alas, no supporting characters and somebody will eventually have to give Mary Elizabeth Ellis and William Devane something to do, much less figure out what the kids are supposed to be. Kumail Najiani has the pilot's highest ratio of lines-to-chuckles, but I don't know if he's ever going to be back. Natalie Morales, featured in FOX pictures as a cast regular, isn't in the pilot. So what's the series? Dunno. Desire To Watch Again: I think Rob Lowe and Fred Savage are a good combo and I think a good series could revolve around their characters, especially if I no longer have to hear them explain what the show is about. I really want to see a second episode, because this is a case in which the second episode could be everything. If the show loosens up and gives the ensemble things to do, it could work. If not, clips from the show-within-a-show "Grinder" may be the best reason to watch. This plot sounds remarkably similar to the premise of "Mystery Girls" the terrible ABC Family sitcom with Tori Spelling and Jenni Garth.